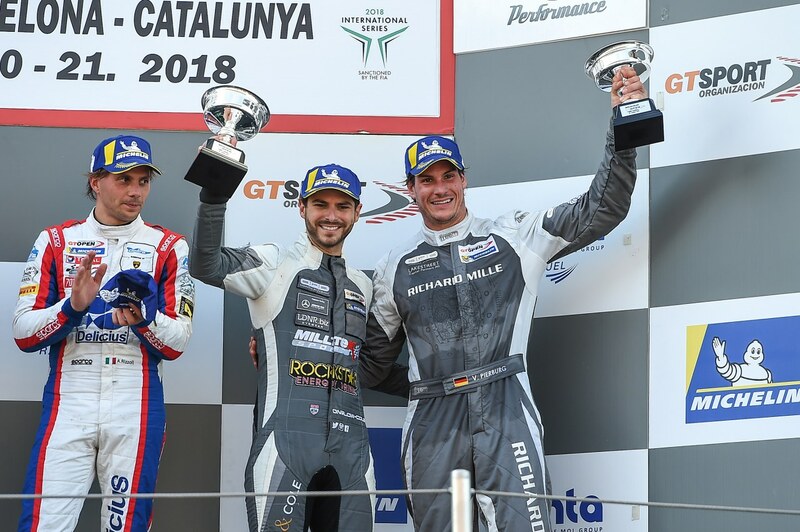 On the last weekend it was all or nothing for the team from Willsbach: on the schedule was the finale of the International GT Open at the Circuit de Barcelona-Catalunya! With a small gap to the next competitor on the championship-standings the team around team manager Stephan Sohn travelled to Spain. Because they reached P3 in the tests and the Free Practices it was clear, that the two drivers of the SPS Mercedes-AMG GT3, Tom Onslow-Cole and Valentin Pierburg, have the possibility to fight for the championship title. This was the perfect preparation for the Qualifying 1 on Saturday: There, Tom Onslow-Cole could reach P1 in the overall rating with a lap time of 1:43.404, so he could gain pole position for the first race! Another pole position for the SPS team after several successful race weekends in a row! The competitors for the championship title, the Lamborghini Huracan GT3 of Ramos / Crestani reached P2. The first race started at 3:40pm and to make it short: Valentin Pierburg and Tom Onslow-Cole won the first race in Barcelona after a perfect driving performance! After the result for this race it was clear, that the Pro-AM championship will be decided in the last race of this season. At this time the SPS Mercedes AMG GT3 was only 4 points behind the Lamborghini of Ramos/Crestani. Motorsports can’t get more exciting! On Sunday, Valentin Pierburg secured a good starting position in the Qualifying 2 for the final race, he placed the SPS Mercedes-AMG GT3 with the Richard Mille-Livery on the sixth starting position in the class. The championship competitors started on P8… so it was a close-run thing! During the race the starting number #20 could gain a few positions in the field and after a perfect performance of Valentin Pierburg and Tom Onslow-Cole, paired with a “no fault” crew, they could finish the race on position 2. After this heart-stopping finale it was clear: The SPS-Mercedes team is equal on points with Miguel Ramos and Fabrizio Crestani, but: they had more victories in the season and therefore they clinched the title!!! SPS automotive performance is Pro-AM champion of the International GT Open season 2018!! !